You are here: Home / Fun Activities For Kids (By Age) / Activities For Elementary School Kids / 30 Aluminum Foil Crafts & Art Activities – everyday frugal fun! 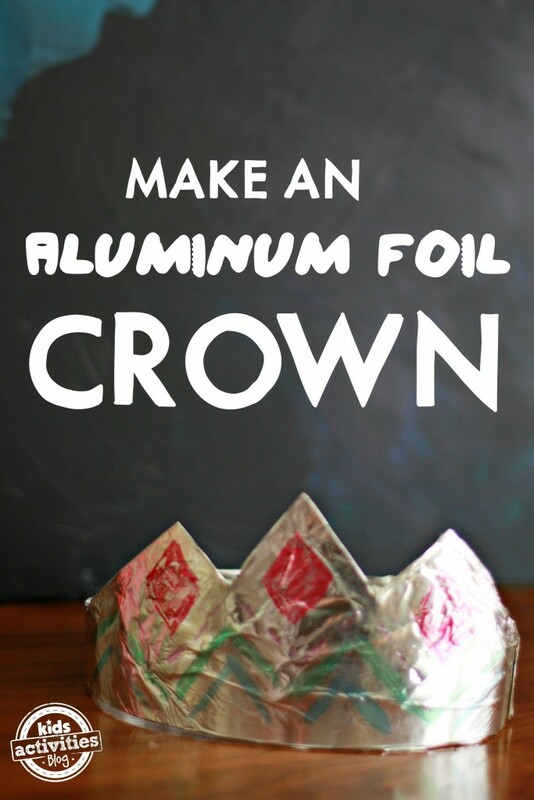 30 Aluminum Foil Crafts & Art Activities – everyday frugal fun! We can all easily get so caught up with Pinterest and all the beautiful crafts on there that we forget about the myriad of possibilities when using simple everyday materials such as aluminum foil, toothpicks, wine corks, cardboard boxes and anything else from the kitchen, recycling bin and even daddy’s toolbox!. I made a cardboard toy camera recently using the lid of a laundry detergent bottle as the lens and it turned out so cool – crafts and activities made with everyday household materials are the best fun. 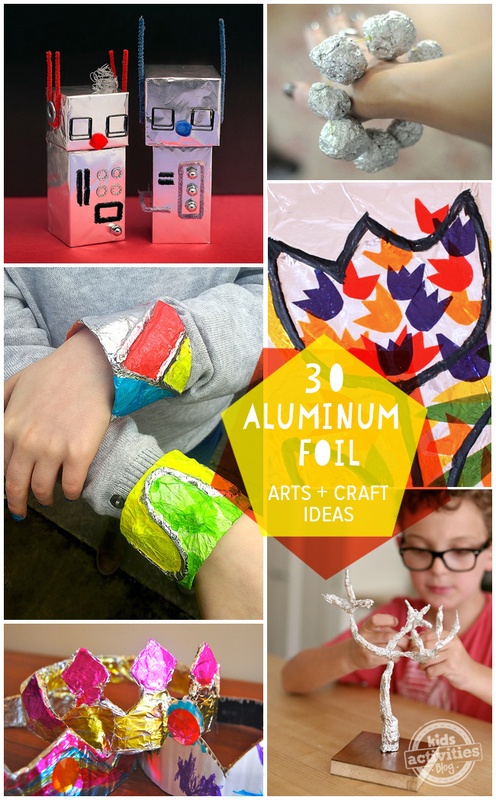 Read on down and click through to be inspired by these 30 ‘best of’ ideas for aluminum foil crafts and art activities. 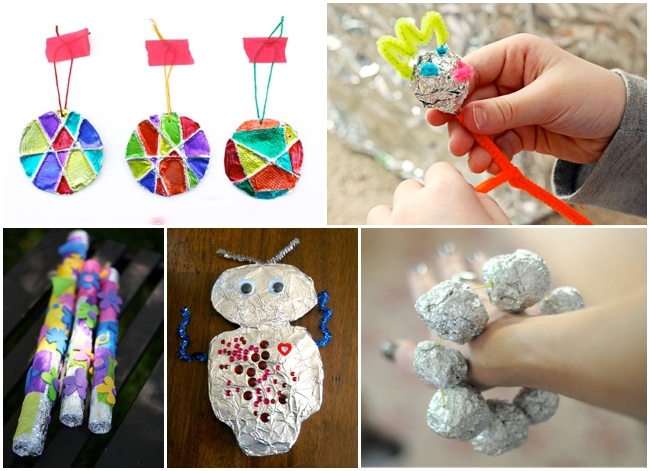 Tin foil is also a grey material for quickly wiping up some cool props for story time – click through to see fun and cute alien spaceships by KidsStuffWorld for Buzzmills. 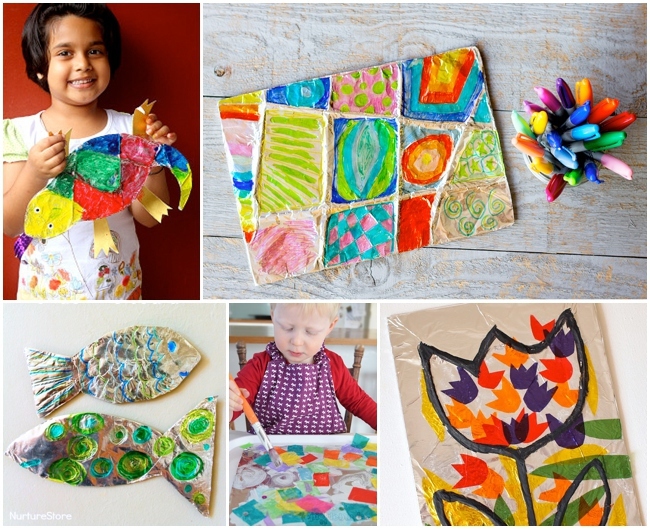 I adore this craft activity. Cereal Box Robots – dive into the recycling stash to come up with all the materials you need to make quirky cereal box robots with the kids, right here on KAB. I spotted the above right cool zentangle art activity for kids by LetsLassoTheMoon last year and it got me to look at aluminum foil in a fresh new way. Such a unique and creative no-cost way to keep the kids entertained. To find more crafts with things you’ve got laying around your house check out our book: 101 Kids Activities That Are The Bestest, Funnest Ever! Previous Post: « 5 Active Learning Techniques: Stand Up & Study!